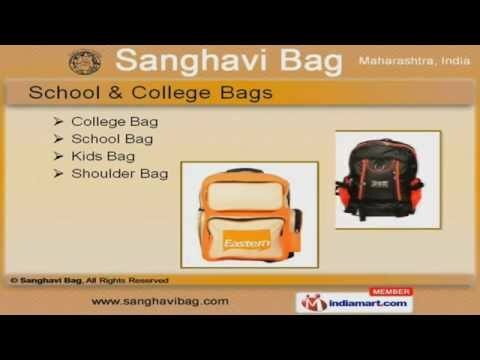 Welcome to Sanghavi BagManufacturer & Supplier of Bags & Pouches ProductsThe company was established in 2010 at Mumbai. Our Ethical business practices & Innovativedesigns help us to serve Indian subcontinent, South East Asia & other countries. Ramaratna Group, WTC & ITAS are some of our esteemed clients and we are supported byexpert manpower, Assured quality & defect free range. We offer a splendid range of Designer Umbrella, Trekking, Backpack & Laptop Bags. Our Carry & Pouch Bags finds huge demand in the industry for durability, smooth finish andhigh holding capacity. We also provide School & College Bags that have eye catching designs, colors & are light inweight. Our Designer Umbrella & Trekking Bags are a class apart. Backpack & Laptop Bags are offered in trendy shades and colors that meet the specificrequirement of our clients in the best possible manner. Along with that we offer Office, Sling & Travel Bags that are cost effective.